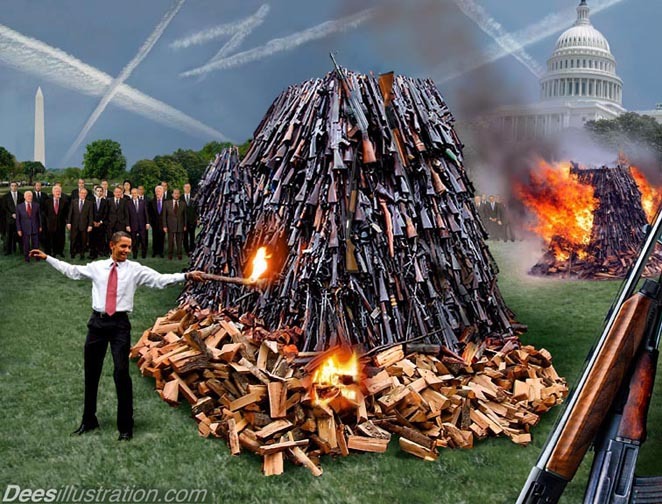 "FALSE FLAG" ATTACK TO BAN GUNS? In the hours, days and weeks ahead, we can expect a concerted attack on the right to own firearms and the Second Amendment in response to the shooting in Colorado last Friday morning. Proponents of disarming the public will argue that restricting the right to own firearms will prevent mass murders and violence. 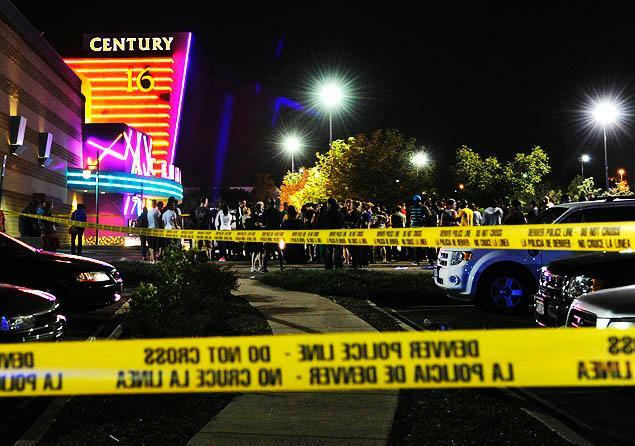 One moviegoer with a legally registered firearm could have prevented 70 innocent people from being shot at the movie theater in Aurora, Colorado. Remember this when your Congressman or Senators tell you they want to take away your Second Amendment right to own a gun. Your best protection is not waiting for a policeman to show up to shoot an assailant who has just shot you, but an armed citizen using his constitutionally protected right to defend himself and others. In the video below a 71-year-old man thwarted a robbery at a Florida Internet cafe on Friday when he shot two would-be assailants and the entire ordeal was captured on security tape. And in Garden Grove, California the other day, a 65 year old woman with a gun chased 5 armed criminals out of her jewelry store. See the video below. Let's look at a few statistics regarding gun control in this video. As you can see gun control goes against the wishes of our founding fathers and our very heritage as a Christian nation. Gun control proponents want to ban guns not to protect you but to control you. They want to take away your right to defend yourself guarenteed by the Second Amendment. Our forefathers shed their blood to grant you that right. Don't let some pinstripe politician take it away. As former U.S. Attorney General Janet Reno stated in the video "Waiting periods are only a step. Registration is only a step. Prohibition of firearms is the goal." I can not think of anything more un-American than this. One smooth talking pinstripe politician is President Barack Obama. He is working overtime to take away your right to defend yourself. Russia, China, France -- with its new Socialist government -- Britain and the Obama administration are writing the treaty behind closed doors. The group writing the treaty is not promising. Russia and Britain ban handguns and many other types of weapons. The possession of guns for self-defense is completely prohibited in China. The Obama administration is undoubtedly the most hostile administration to gun ownership in US history, with Obama having personally supported bans of handguns and semi-automatic weapons before becoming president. And remember the recent scandal where the Obama administration was caught allowing guns to go to Mexican drug gangs,[Operation Fast and Furious] hoping it would help push for gun control laws. Um ....Do I smell a "false flag" operation here? Check out these "false flag" operations where our government either proposed murder and terrorist events or actually carried them out. Operation Northwoods,.Operation Gladio,and Operation Ajax. How convienient for the this event to coincide with Obama's Arms Trade Treaty. As you can see from the prior two links the U.S. government through it's covert arms such as the CIA and other agencies is capable of murdering it's own citizens and staging terrorist events to attain it's goals. But would the U.S. government use a "patsy" [James Holmes in the Aurora Colorado movie theater terrorist attack] such as Hitler did to stage the Reichstag Fire to coerce the German Parliament to give him dicatorial power? Have you heard that the anthrax attacks - which were sent along with notes purportedly written by Islamic terrorists - used a weaponized anthrax strain from the top U.S. bioweapons facility? Indeed, top bioweapons experts have stated that the anthrax attack may have been a CIA test "gone wrong." For more on this, see this article by a former NSA and naval intelligence officer and this statement by a distinguished law professor and bioterror expert (and this one). It is also interesting that the only Congress members mailed anthrax letters were key Democrats, and that the attacks occurred one week before passage of the freedom-curtailing PATRIOT Act, which seems to have scared them and the rest of Congress into passing that act without even reading it. And though it may be a coincidence, White House staff began taking the anti-anthrax medicine before the Anthrax attacks occurred. [Regarding Operation Gladio]As confirmed by a former Italian Prime Minister, an Italian judge, and the former head of Italian counterintelligence, NATO carried out terror bombings in Italy with the help of the Pentagon and CIA and blamed communists in order to rally people's support for their governments in Europe in their fight against communism. As one participant in this formerly-secret program stated: "You had to attack civilians, people, women, children, innocent people, unknown people far removed from any political game. The reason was quite simple. They were supposed to force these people, the Italian public, to turn to the state to ask for greater security." Former prominent Republican U.S. Congressman and CIA official Bob Barr stated that the U.S. is close to becoming a totalitarian society and that elements in government are using fear to try to bring this about. In this case creating fear in the uninformed to turn to the government to demand the banning of all firearms. Remember the intent of the Gladio terrorist attacks on the unsuspecting public: "You had to attack civilians, people, women, children, innocent people, unknown people far removed from any political game. The reason was quite simple. They were supposed to force these people, the Italian public, to turn to the state to ask for greater security." This is treason in my book and any elected officials complicit in these provocateur acts should serve jail time. Eric Holder and Barak Obama to name a few. When you hear of a mass shooting or terrorist attack on American soil ask yourself who stands to gain from it. Does this benefit the current government agenda such as removal of constitutional rights, banning guns, or leading the United States to war? 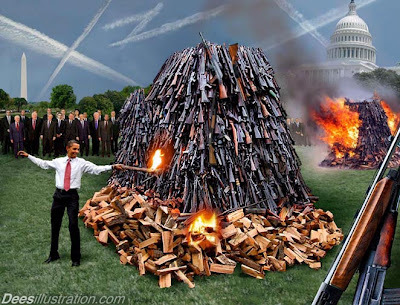 Government creates a problem (terrorist attack, methods, explosives supplied through CIA etc) to make us dependent on it's solution(ban on all firearms)through the use of fear, intimidation, propaganda, and coercion. The classic Hegelian Dialectic.